On May 23, 2013, The Boy Scouts of America's national governing body voted to rescind the long-standing ban on homosexual youth in the program. Effective January 1, 2014, "No youth may be denied membership in the Boy Scouts of America on the basis of sexual orientation or preference alone." Prior to this, the Boy Scouts of America's official position was to "not grant membership to individuals who are open or avowed homosexuals" as Scouts or adult Scout Leaders in its traditional Scouting programs. As early as 1980, the Boy Scouts of America have denied membership from openly homosexual individuals applying for adult leadership positions. In 1991 the BSA released a position statement expressing the organization's official position, stating: "We believe that homosexual conduct is inconsistent with the requirement in the Scout Oath that a Scout be morally straight and in the Scout Law that a Scout be clean in word and deed, and that homosexuals do not provide a desirable role model for Scouts.” The BSA thus "believes that a known or avowed homosexual is not an appropriate role model of the Scout Oath and Law." The language used to describe the BSA's policies on homosexual individuals has evolved over time, stating in a 1993 position statement that: "We do not allow for the registration of avowed homosexuals as members or as leaders of the BSA." 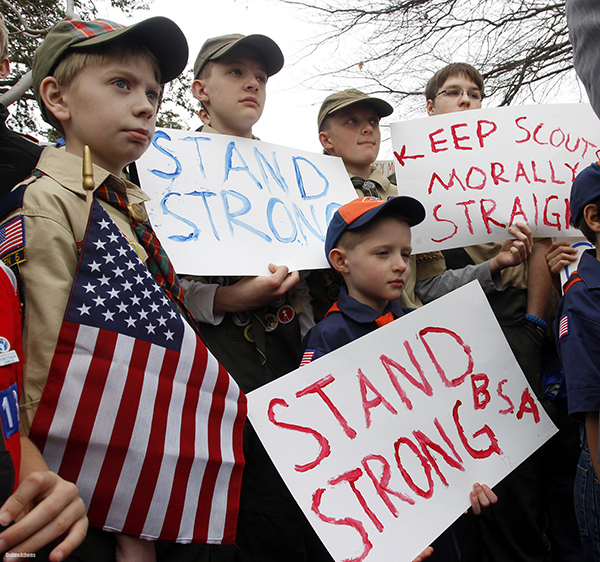 The BSA adopted a new policy statement in 2004 which included a specific "Youth Leadership" policy stating that: "Boy Scouts of America believes that homosexual conduct is inconsistent with the obligations in the Scout Oath and Scout Law to be morally straight and clean in thought, word, and deed. The conduct of youth members must be in compliance with the Scout Oath and Law, and membership in Boy Scouts of America is contingent upon the willingness to accept Scouting’s values and beliefs. Most boys join Scouting when they are 10 or 11 years old. As they continue in the program, all Scouts are expected to take leadership positions. In the unlikely event that an older boy were to hold himself out as homosexual, he would not be able to continue in a youth leadership position."